Designed to be pulled behind die-cast pedal tractors only. Q: Do you know if the John Deere Riding Tractor Trailer Attachment will also fit the John Deere tricyle? A: If your Mighty Trike has a spot for a hitch pin then yes it will work. It may not sit level and may angle towards the Trike. 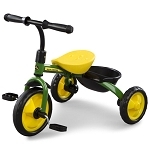 Q: I recently purchased the John Deere mighty trike - will this trailer work with it? 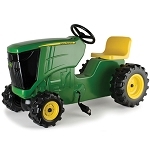 A: This item is designed to only work with the John Deere pedal tractors. This item is NOT designed for the Mighty Trike. 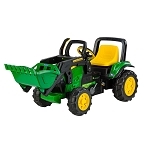 This wagon goes perfect with the tractor my son got for his 3rd birthday, also from The Green Fun Store. It shipped really fast, wonderful service. Works great with our pedal tractor. Our four year old loves it! The trailer is adorable and my little grandson is going to have years of play with it and may even pass it on to his little ones some day. Thank you! So Cute!!! !I would buy this little trailer again, as it completes the set. John Deere toys build strong kids. 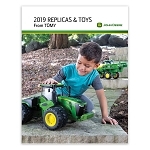 I sent the tractor trailer to my 3 year old grandson to pull behind his john Deere pedal tractor. When he opened the package, he said that he was going outside to plant his field. He is a city boy living in Dallas!!! John Deere brings out the country in our children!! Best of all is that my grandson pedals a toy! He is building muscles and learning to 'drive"! My daughter told me the other older boys are not strong enough to pedal the tractor! 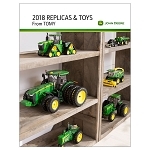 John Deere toys help develop strong children!! Thank-youfor the superior customer service and quick shipment! This will be a wonderful birthday gift for our son! We are so very please with the Green Store service and products. Our Grand kids love pulling this little trailer behind their John Deere Pedal Tractor!!! Thanks we are now loyal customers!!!!! Very happy with John Deere trailer! Restoring an original John Deere tractor for our Grandson that was our sons! Got the trailer to go with restored tractor! 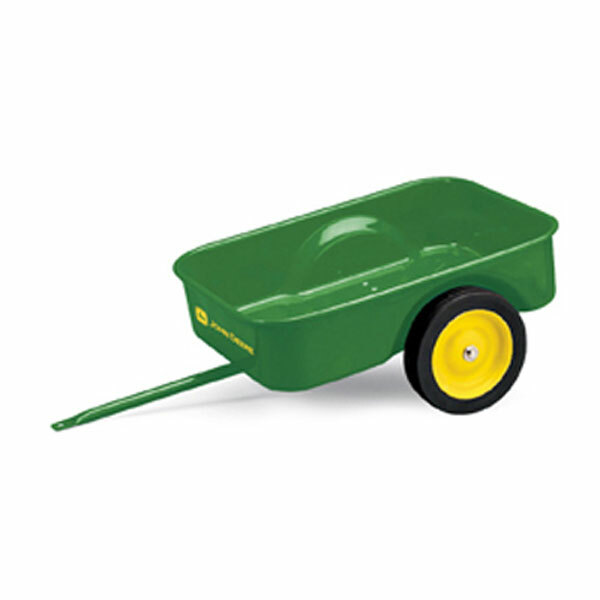 Perfect, high quality metal wagon that fits the tractor, works with pin purchased also. The set is exactly what we were looking for as a gift to our grandson to use and keep for years. It is not plastic, heavy metal, hard to find. The price and shipping best at Green Fun Store!